Come experience the ultimate Baja getaway…come to Casa Grande, located 15-minutes south of San Felipe. You’ll enjoy this spacious 3,200+ sq. ft. home, situated directly on the most pristine beach, 100 yards from the water edge, with spectacular unobstructed views of the Sea of Cortez. All the convenience of a vacation in the USA coupled with the amazing beauty of the sea and beach, and the charm of San Felipe. This wonderful home is ideal for family getaways, gathering of good friends, corporate retreats or as a venue to host weddings, christenings and other special events. Private pilots will love that the house is just 15-minutes from the international airport. Our villa was constructed with luxury in mind. There are high ceilings, tile and marble floors, custom cabinetry and woodwork, granite counters, stone columns and walls, premier lighting and central air conditioning with 3-zones to assure maximum comfort. Our accommodations, 5-star furnishings, window treatments and artwork will astound even the most finicky guest. Awake each day by a breathtaking sunrise and the rhythmic sound of waves rolling on the beach. Indulge in the most relaxing sleep in one of our 4 Large Bedrooms…super comfortable mattresses, tall beds, generous closets, ceiling fans, beautiful bed linens, bath towels and appointments, and breath-taking views. You’ll find the 3-1/2 bathrooms equally stunning with travertine marble floors and walls, beautiful vanity cabinets and hand selected mirrors. You’ll feel like you’re in a deluxe hotel suite in our main master bedroom: King Bed, 180-degree view of the sea, brick ceiling dome, luxurious master bath with separate shower and spa tub, a seating area with TV/DVD. The 2nd master bedroom has a King Bed, private bathroom, ocean view, chaise lounge, private trellis/patio. The 3rd & 4th Bedrooms are equal in comfort, have Queen Beds, ocean view/mountain view, share a full bathroom and half-bathroom. Enjoy the common areas that encourage comfortable, festive gatherings and offer panoramic views of the sea. Relax in the spacious living room that accommodates a large party under a brick ceiling dome. The gourmet kitchen is generous with ample room for the evening’s chef to prepare a banquet. Top of line appliances, walk-in pantry, fully equipped kitchen allow for unlimited possibilities. If you prefer dining al fresco, the roof terrace has a complete outdoor kitchen with a four-burner gas grill, separate food warmer and a sink for easy cleanup. You supply the “catch of the day”; everything else is provided for you. The dining room is equal in class, furnishings and ocean views...the big square onyx table is made for festive gatherings and fresh food. We even have a cook available that can take care of any size gathering. So you don't feel like you're roughing it, Casa Grande is equipped with three large flat screen TV's, DVD players & a satellite dish. There is even an entertainment alcove which will give guests a place to getaway to watch a movie or maybe play a board game. Experience our expansive tiled roof terrace and be in awe of the panoramic views of the sea, nearby mountains and the most spectacular sunsets and night skies—you’ll be entranced by the thousands of stars and the milky way! It’s the perfect place to relax, grill, dine al fresco and dance the night away. In the two-car garage there is ample room for large vehicles or to store your desert toys (motorcycles or quads). To assure nothing is overlooked, you will also find a washer/dryer and additional storage should you want to make it an extended visit. Lastly, the home is equipped with a smart wired security system and outside sensor lights. As the day winds down, nature’s splendor will reward you with the daily gift of a spectacular sunset. Enjoy the moment with a beverage while sitting around the fire pit. Don’t forget to bring your marshmallows, favorite chocolate and graham crackers. There’s nothing better than s’mores by the sea! After the sun sets, head up to the roof terrace for star gazing. You have found your private paradise, yet you have unlimited things to do within minutes of your front door. Take a dip in the calm, warm waters; fish from the shore, or take a private stroll on the beach collecting shells or sand dollars. Venture into town to enjoy a terrific meal at the many local restaurants or pick up a memory at the various shops. The pace is tranquil in San Felipe so each day of your visit you’ll slowly release from the hectic demands of your present life. If you’re looking to getaway, come to Casa Grande! Enjoy beautiful sunsets and sunrises, warm weather year round, world class fishing and off-roading are just a few things to experience here. 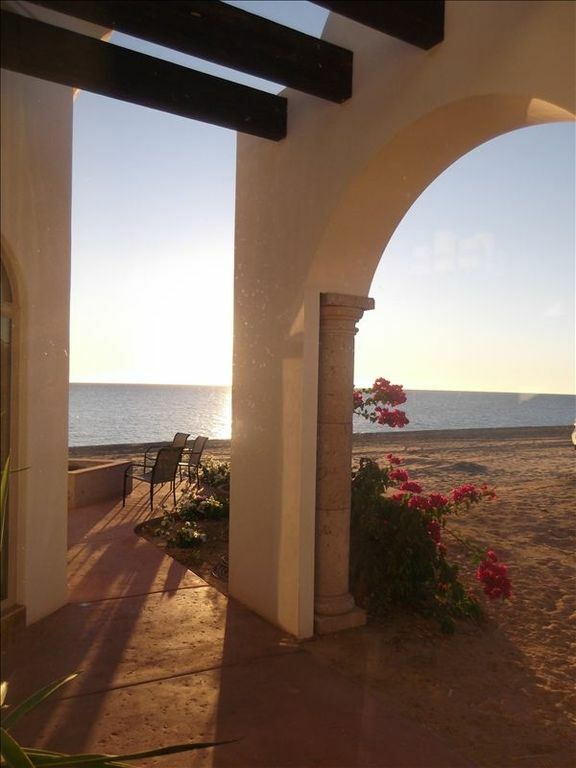 Located directly on the most pristine section of beach in all of San Felipe. Soft white sand, beautiful blue sea. The most beautiful ocean directly in front of you, with view of ocean from nearly every room in the house. Linens are provided for the 4 beds. extra large 2-car garage. Can fit 2 large SUV's. Bath towels are provided for up to 10 people. Beach towels are also provided. Free wireless internet. The wifi network and password information is noted in the house instructions. There is a drip coffee maker. Coffee filters are stocked. Filters are readily available in town should the supply be out. Large gourmet kitchen with pantry, stainless steel appliances, fully stocked with pots, pans, baking dishes, utensils & dishes. There are 8 dining room chairs around a large square onyx table. The dining table can accommodate up to 12 people if needed. There are additional chairs in the house that can be used. (3) Large flat screen TVs with DVD players in living room, media room & main master bedroom. Satellite TV, (Direct TV service). Video library has 2-dozen plus DVD movies. Book library located in main master bedroom. Large patio with raised fire pit made of cantera stone. Extremely large tiled room deck with gas grill, wet bar & seating. This is the ultimate getaway for you, your family and friends. There is nothing like enjoying the sounds and beauty of the ocean during the day, and at night, gathering around the fire pit for s'mores and stars. Given the size, location and amenities, the house is also ideal for weddings, christenings and other special events. This incredible custom home is located directly on the most beautiful beach in San Felipe, just 10 miles south of town at the 9km marker just past Punta Estrella. The premier lot and uninterrupted views allow you and your guests to enjoy the beach and the Sea of Cortez from the patios, roof deck and nearly every room in the house. There is only a vast beach and mountain range, so if you would like to do some off-roading, shelling, fishing or boating, the choices are endless. Beautiful view and beatiful home right on the beach! Large beautiful house with all the amenities. Slept 10 people comfortably. Great place that the whole family enjoyed. Nice clean beach, very relaxing and not over populated. We will be going back! Love, love, love...steps from the ocean day or night, exceeded all expectations! Beautiful house, better than the pictures...there were 3 adults and 5 children, I never felt cramped. Kids had their PlayStation in the media room but barely played it because they were having so much fun outside, had directtv in the living room and Netflix so never felt disconnected (in the master use the DVD player for Netflix). Upstairs is beautiful having evening dinners using the bbq, (la vaquita market had pre marinated chicken and pork that was super delicious) the lights set the prefect mood even for the kids it wasn’t too dark. We put good use of the fire pit every night listening to waves crash, unforgettable. We had quads rented for our entire stay, there are no rules so all day all night we used them on the beach and on the trails all over the place. We had a unique and unforgettable experience that I don’t know where else can be replicated. The weather was perfect our entire stay day and night, love watching the high tide come real close to the house, and low tide so far out felt we could walk a half mile out...the water was warm day and night. The drive into town is about 15-20 min which we got used to real fast but honestly we barely went into town once we loaded up at Cali Max and la vaquita market for the week. Jamie the handiman was super helpful day and night...have nothing negative to say about this trip only that the jacuzzi didn’t work because the switch was burnt out but that hardly put a damper in our stay at all. There were no neighbors around when we stayed so we had the music bumping at night and no complaints...love, love, love it!!! Hope to return as soon as possible now that we’re familiar with everything it’ll be twice as fun. Thanks Doug for opening your home to the public! Thank you and thank you again!!! Great house, great Location, definitely going back! It was an excellent stay with my friends and family at this perfect home. You will not have any trouble filling your days with activities or just relax around the house or on the beach. Your worries and stress melt from the moment you arrive. If you have quads or motorcycles bring them along, you can ride them right on the beach outside the front door. If you have a small boat or jet ski, it can be launched in front of the house to go fishing, sailing, kite surfing, wake boarding or water skiing. You can rent a boat at the marina and rent quads in town. The shelling and fishing from the beach are spectacular. There are plenty of great restaurants and shopping in town. We have referrals for all of your needs no matter what they may be. Rates are subject to change until reservation is secured.